You’ve got the old, new, borrowed, and blue…so why not add a splash of green? 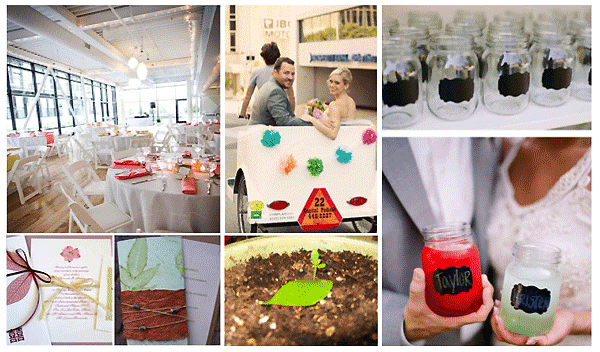 In honor of Earth Day, KK is checking in on some fun new ways to make your wedding environmentally friendly! If you haven’t chosen a location yet, look into holding your event in an eco-friendly location! Parks, nature reserves, and buildings that meet government ‘green design’ standards are all great options. A Chicago venue we love is The Greenhouse Loft. transportation is an important aspect of many events—getting guests to and from your event and companies making deliveries are both very necessary. Help limit your carbon footprint by using local vendors, hiring a shuttle service, and encouraging guests to carpool to your event. You can even mix things up and opt for a brightly decorated pedicab for the bride and groom! There are businesses out there that help you “pay it forward” by calculating and paying back carbon emissions – skip the trinkets and make that your wedding favor! If you really want to give something away make it a seedling or plant. Another favor idea is to give everyone a glass to call their own for the night! Chalkboard stickers allow for easy personalization, and this helps eliminate the need for anything disposable, dishwashing energy and water after the event. Plus it’s super fun and hip! Happy Earth Day… Today and EVERY DAY!